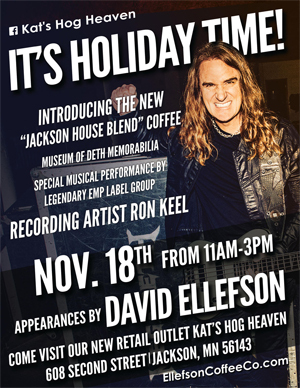 MEGADETH bassist David Ellefson will return to his hometown of Jackson, MN, Saturday, November 18th for a special end of the year/birthday celebration at Kat’s Hog Heaven, the newest Ellefson Coffee Co retail location. Located at 608 2nd St, Kat’s is the pride of Jackson, serving a full BBQ dining menu, and now serving, and a retail outlet for Ellefson Coffee Co. coffee and merchandise. Additionally, Kat’s will be displaying various memorabilia from Ellefson’s MUSEUM OF DETH, featuring memorabilia from Ellefson’s life and career.